Spend just £60 more to qualify for free shipping! Philips Zoom DayWhite and NiteWhite offer superior at-home whitening for a visibly whiter smile in one day and your whitest healthiest smile in seven to fourteen days. They are the only at-home whitening products to contain amorphous calcium phosphate (ACP), which is clinically proven to reduce sensitivity, protect enamel and help improve the luster and smoothness of the teeth. Philips Zoom Day White 6% uses Hydrogen Peroxide which gives the fastest whitening results. As a comparison 7% Day White is around 22% Nite White in strength. Philips Zoom Day White is designed to be used for short periods of time during the day. Contain amorphous calcium phosphate (ACP), to reduce sensitivity, protect enamel and help improve the lustre and smoothness of the teeth. Philips Zoom DayWhite and NiteWhite offer superior at-home whitening for a visibly whiter smile in one day and your whitest healthiest smile in seven to fourteen days. Philips Zoom DayWhite and NiteWhite offer superior at-home whitening for a visibly whiter smile in one day and your whitest healthiest smile in seven to fourteen days. They are the only at-home whitening products to contain amorphous calcium phosphate (ACP), which is clinically proven to reduce sensitivity, protect enamel and help improve the lustre and smoothness of the teeth. Over 10 million patients have had their smiles brightened by a Zoom treatment. We understand that patients have different needs when it comes to whitening-that’s why we’ve designed three different Zoom products. Whitening treatments help to reduce existing stains, but through consumption of coffee, soft drinks or just through natural ageing, your teeth may eventually become discoloured again. Maintenance whitening can help combat recurring discoloration. 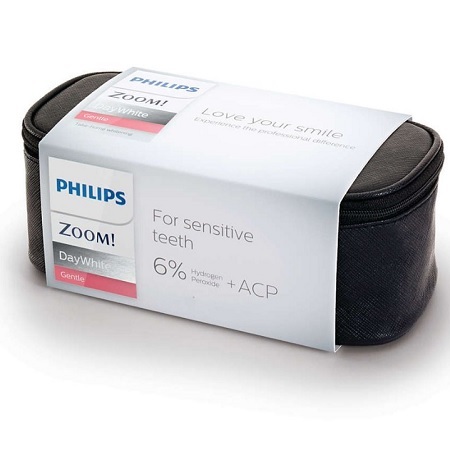 Only Philips Zoom at-home whitening products include ACP, which has been shown to help reduce whitening fade-back. More information direct from the manufacturer available here. If you have any other questions regarding this product please contact us here.